Catulle Mendès (22 May 1841 – 8 February 1909) was a French poet and man of letters. 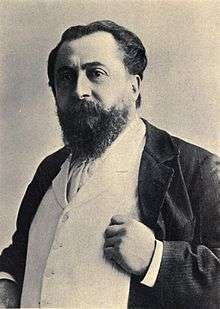 Of Portuguese Jewish extraction, Mendès was born in Bordeaux. After childhood and adolescence in Toulouse, he arrived in Paris in 1859 and quickly became one of the proteges of the poet Théophile Gautier. He promptly attained notoriety with the publication in the La Revue fantaisiste (1861) of his Roman d'une nuit, for which he was condemned to a month's imprisonment and a fine of 500 francs. He was allied with Parnassianism from the beginning of the movement and displayed extraordinary metrical skill in his first volume of poems, Philoméla (1863). His critics have noted that the elegant verse of his later volumes is distinguished rather by dexterous imitation of different writers than by any marked originality. The versatility and fecundity of Mendès' talent is shown in his critical and dramatic writings, including several libretti, and in his novels and short stories. His short stories continue the French tradition of the licentious conte. In 1866 Mendès married Judith Gautier, the younger daughter of his mentor Théophile. They soon separated, and in 1869 he began cohabiting with the composer Augusta Holmès with whom he had five children. The couple parted in 1886, and he later married the poet Jeanne Nette, who was to be his last companion. Early on the morning of 8 February 1909, the body of Mendès was discovered in the railway tunnel of Saint Germain. He had left Paris by the midnight train on the 7th, and it is supposed that, thinking he had arrived at the station, he had opened the door of his compartment while still in the tunnel, although some biographers have suggested suicide. His body was interred at the Montparnasse Cemetery. Le NU au SALON , 1900 (published in 1901). The cover image is of a painting by Jules Scalbert, gravure de Louis Geisler. A report addressed to the minister of public instruction and of the fine arts on Le Mouvement poétique francais de 1867 à 1900 (new ed., 1903), which includes a bibliographical and critical dictionary of the French poets of the 19th century. ↑ "Mendès, Catulle". JewishEncyclopedia.com. Retrieved 2013-12-13. 1 2 "Biografía de Catulle Mendès". Iesxunqueira1.com. Retrieved 2013-12-13. Wikimedia Commons has media related to Catulle Mendès.